This article appeared on The Diplomat on March 10, 2017. The deployment of the Terminal High Altitude Area Defense (THAAD) system to South Korea, announced by U.S. Pacific Command on March 6th, improves the United States’ deterrent against North Korean attack. Yet it could also significantly damage strategic stability between the United States and China—a downside that has not been widely discussed. U.S. officials and China watchers are quick to downplay Chinese concerns by emphasizing THAAD’s defensive nature and asserting that North Korea is the primary target of the system. The North Korean threat is a real danger that should be addressed, but addressing that danger in such a way could cause worse long-term problems for East Asia. Are China’s concerns about U.S. missile defense exaggerated? Perhaps not. The major potential cost of America’s decision to deploy more ballistic missile defense (BMD) systems to East Asia may be in how China reacts. The deployment of THAAD, coupled with America’s considerable ability to target China’s nuclear forces with conventional and nuclear weapons, presents Beijing with strong incentives to adjust their nuclear forces and doctrine. In so doing, China would improve the survivability of its nuclear deterrent, but undermine strategic stability. During the Cold War, China’s nuclear forces were unique due to the small size of its arsenal, which stood in stark contrast to their massive American and Soviet counterparts. Mao Zedong considered nuclear weapons to be “paper tigers” that would be useless on the battlefield, and he had no interest in joining a nuclear arms race with the two superpowers. China’s modern nuclear force has improved its secure second strike capabilities, but it is still puny compared to the United States, and it still adheres to a no first use doctrine that was first declared in 1964. China’s small, survivable nuclear force bodes well for strategic stability, because there is little incentive for such a force to use nuclear weapons first in a conflict. A small nuclear force is incapable of disarming a better-armed adversary like the United States, but such a force could ride out a first strike and feel confident in their ability to strike back. 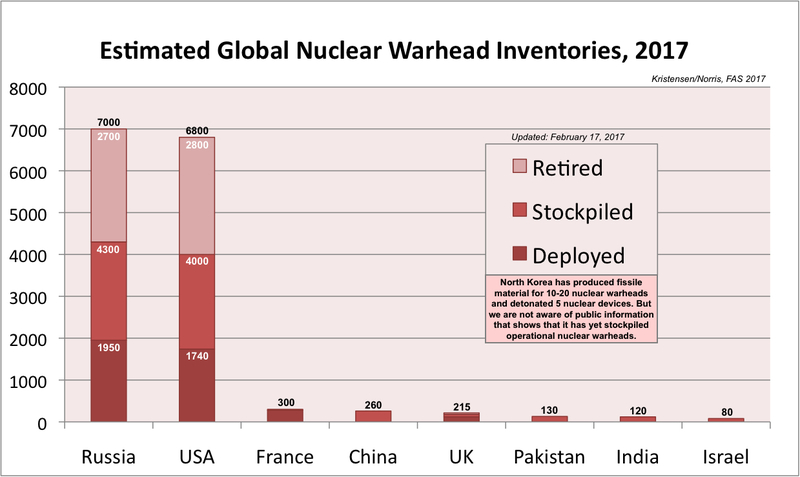 The high cost of an assured second strike prevents the United States from using nuclear weapons first, while China doesn’t use nuclear weapons first because it couldn’t disarm the United States. THAAD and other forms of BMD upend this strategic balance by providing the United States a degree of protection against nuclear retaliation. The United States could feel more confident about conducting a first strike against Chinese nuclear forces if the few surviving forces can be defeated by BMD systems. Improvements to American remote sensing, conventional precision strike, and nuclear capabilities increase the potency of a disarming first strike, while advances in BMD systems increase the likelihood that China’s surviving nuclear weapons can be destroyed en-route to their targets. If the survivability of China’s relatively small nuclear arsenal is threatened, it would make sense for Beijing to make adjustments in doctrine and weapons technology that bolster survivability and keep the assured in “assured retaliation.” Changes to China’s no first use doctrine would be a major policy shift and face domestic hurdles. However, recent Chinese military publications argue for improving early-warning capabilities and placing nuclear forces on a higher alert level so China’s forces can get off the ground before being hit by a U.S. first strike. Adjustments to weapons technology can also enhance survivability. Adding more nuclear warheads to individual missiles would give a bigger punch to missiles that survive a first strike, while hypersonic glide vehicles can conduct flight maneuvers that make it difficult for BMD systems to intercept the warhead. All of these options would have negative effects on strategic stability because they encourage preemption. China faces a “use it or lose it” problem, while the United States could face a window of opportunity to destroy Chinese nuclear forces as early as possible in a conflict. The risks of a crisis or conventional conflict escalating to the nuclear level become more acute. Of course, it is impossible to say with absolute certainty that this bleak scenario will unfold. While there are multiple ideas about how China could change its nuclear forces and doctrine in destabilizing ways, there have been no official policy announcements yet. Beijing may also conclude that its inability to rein in North Korea’s behavior is to blame for THAAD’s deployment and adjust their policy in ways that reduce the North Korean threat and the need for THAAD. It is also important to note that THAAD cannot shoot down Chinese intercontinental ballistic missiles that are aimed at the United States, but it can help other BMD systems track and engage such missiles. While Beijing’s response is unknown at this time, there are strong incentives for China to adjust nuclear doctrine and weapons technology in ways that undermine strategic stability. THAAD does benefit the United States by complicating North Korea’s ability to conduct missile strikes against the ports that follow-on U.S. forces would use in a conflict. Yet while the THAAD deployment may reduce the chances of nuclear escalation on the Korean Peninsula, it may also increase the likelihood of nuclear escalation with China. Eric Gomez is a policy analyst for defense and foreign policy studies at the Cato Institute.